Gor Mahia returnee Meddie Kagere was on target in his very first game back at the club after a six month hiatus. This bodes well for the team and his partnership with compatriot Jacque Tuyisenge. Kagere however admitted that he was under intense pressure and was unsure of how he would perform. “I was under pressure and I felt very uneasy even as I was walking into the field. I asked God to give the team a win, even if I wouldn’t score because I knew how much the club’s fans love to win. “Scoring after just 13 minutes was therefore a great relief for me because it took a lot of pressure away from me. I began to feel more at ease with the ball and I even dreamed of scoring another goal,” he said to kpl.co.ke. Aside from the fact that he left in December, Kagere was perhaps feeling the pressure of having to justify his place in the team instead of the Brazilian Lima Da Silva who is preferred by the coach. “The moment we went ahead, I felt comfortable and I think the same thing happened to the rest of the team. We relaxed especially in the second half and allowed Homeboyz back into the match,” he said. he continued. 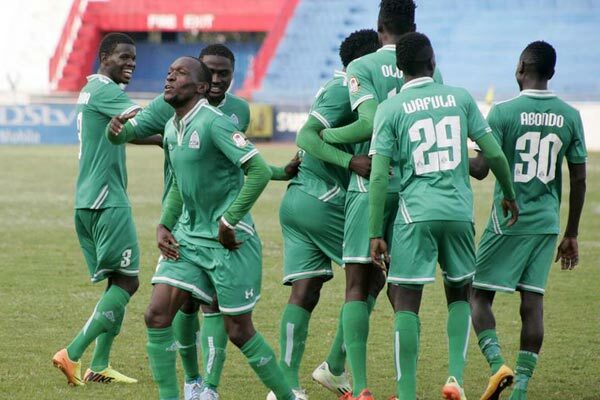 Gor Mahia are now five points adrift of Tusker and Kagere who scored 13 goals in the 2015 season is one of the players who will be counted on to close that gap. The campaign to close the gap starts with the match against Ushuru this Sunday at Nyayo stadium. Ahmed Bhai scored in the final quarter of the game as Kakamega Homeboyz stopped Gor Mahia’s winning streak after 1-1 draw as the sides faced off in Kenya Premier League match played at Moi Stadium Kisumu. 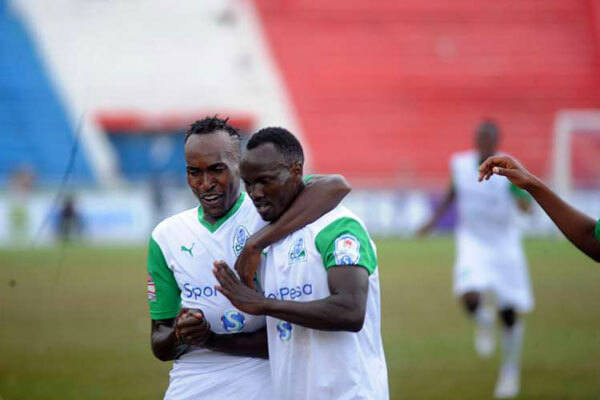 Moses Mudavadi delivered a cross from the left wing at the 82nd minute and Bhai connected it past Boniface Olouch into the net to end their search for a goal against Gor Mahia cancelling Meddie Kagere’s opener. 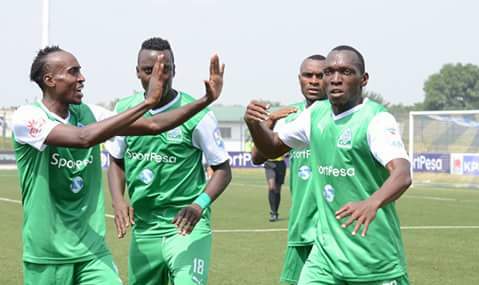 Gor Mahia had started the match strongly with Francis Kahata linking up with George Odhiambo who paced up on the left wing before delivering a low pass to the six yard box and Gor’s ‘prodigal son’ Kagere sent the ball direct into the net giving Kogalo a lead at the 12th minute of the game. Kakamega homeboyz had their goal disallowed at the 20th minute of the game after Athmani Buki header was judged as offside by centre Referee Simuyu Dan and his assistants. Just seconds before Wafula bent in a cross that went straight to Tuyisenge who was unmarked in the box but the forward headed the ball the wide despite being a free header. Kagere and Tuyisenge made a couple of touches before the latter delivered a through pass past Homeboyz back four at the 29th but Wafula Innocent slowly reacted to the ball. Homeboyz had their chances in the game also with Abass Akinyemi picking up a loose ball and before delivering a pass to Bhai who set up Murunga but Gor Keeper Boniface Olouch denied him a chance to find the net punching the ball back to play. In the second half Homeboyz started attacking strongly especially after coach Mike Muiruri introduced Andrew Kulecho, Meshack Karani and David Odhiambo. The side would have scored at the 66th minute but Odhiambo’s shot missed the goal by just an inch wasting the superb build up for the chance. In reply Kahata sent a shot that was deflected towards the goal by Chikati Michael but Michael Wanyika made a superb save to keep the side in game. This is the second draw between these side in a Kenya Premier League match. Gor have moved to second with same points as Mathare United who have been pushed to third due to inferior goal difference. Meddie Kagere and Jacque Tuyisenge have previously played together for Police FC of Rwanda. This happened when Gor Mahia first tried to sign Kagere in 2011. By last weekend, Kagere had not received a work permit. Which is why he did not suit up for the match against Thika United. With the work permit issue sorted out, the duo are set to resume their partnership which has the potential to have a devastating effect on opposing KPL defences. “I know Meddie for long because when I was starting off we played together at Police. He is an experienced striker and I believe if the coach decides to play both of us, we can do great things,” said Tuyisenge to Capital FM. Kagere for his part says he feels at home and is ready to resume the fine form he displayed in 2015. “I am very happy to be back because Gor is like home to me and the fans, players and officials have welcomed me. I am feeling ready to get back to the pitch and do what I do best, scoring goals. I know it will be difficult because I have stayed for six months without competitive football,” Kagere told Capital Sport on Thursday afternoon after scoring and providing an assist as Gor demolished fourth tier side Butterfly FC 4-0 in a friendly match. If coach Ze Maria had any doubts about Kagere’s abilities, sure he must be convinced by now having watched Kagere play in two friendlies and in training. “I have played in two friendly matches and I feel I am ready and if given a chance, I will do my talking on the pitch. I want to do better than I did last year and repay the faith Gor has shown to bring me back” continued Kagere. The other goals against Butterfly were scored by Thiago Silva who scored twice and Baron Jobita. Ze Maria now admits that Kagere is already ahead of the curve compared to his Brazilian compatriot. “We saw that Meddie had been here before and knows the league well and therefore, it would take him less time to adapt. Thiago is still here with us, training and daily he is getting better. Hopefully, next season he will start playing in the league,” coach said to Capital Sport. Ze Maria went on to confirm that fans could see the eagerly awaited Tuyisenge-Kagere partnership this weekend. Kagere is a good player and of course with the history he has in this team, he can do well. Jack (Tuyisenge) is in good form and if the two can have a good partnership, then I think we will do well. I believe he will be in the team this weekend and so let’s see what he has to offer for us,” the coach nicknamed ‘Ze Maria’ said. As for Crispin Odula, he is still sorting out the issue of his international transfer certificate. “I had family problems which forced me to come back home then my contract ended. By the time we were getting back to negotiations the window was closed and so I chose to come back home. Gor gave me a platform and hopefully I can work hard enough to get playing time,” Odula said to Capital FM. Ugandan ace Godfrey Walusimbi who missed the last two matches and was yet to return for the second leg of the 2016 Kenya Premier league, is set to return on Wednesday. Club official Ronald Ngala confirmed his return to goal.com. “Walusimbi had a knock and he also had to travel back home to attend to some personal issue. However, he has now fully recovered and is expected back latest tomorrow (Thursday).” said Ngala. Walusimbi did not play in the recent KPL Top 8 matches nor the GoTV shield match against Mahakama and was rumoured to be leaving. The 27 year old played a key role in the first leg including a classic goal against Mathare United that was an early candidate for KPL goal of the year. He along with Aucho featured prominently in Uganda’s recent Africa Nations cup qualifiers against Botswana. Rwandese striker Jacque Tuyisenge picked up from where he left off at the end of the first leg. On Sunday he struck twice, both from headers to sink Thika United 2-1. Tuyisenge now has 8 goals to his credit, a total which leaves him tied for second place in the KPL scoring charts. Leading scorer Wycliff Ochomo has 11 goal. It is an amazing feat considering that Tuyisenge missed much of the first leg while recovering from an injury. “So far, l am happy to be getting goals. Ideally, scoring goals would be the best thing to happen for a striker and since l am one, it feels so good because it makes me yearn for more and more,” the striker told the club’s site. Tuyisenge also credits the team-mates, officials and the 12th man for his rise to the top of the scoring charts. For now, Tuyisenge is focused on enabling the club to achieve its goals. “My target is to continue working hard with my teammates and offer our best so that we can be somewhere worth talking about,” he added. Fans are eagerly waiting to see the forwardline combination featuring Tuyisenge and Kagere. The duo get along off the field so their on the field partnership is sure to give opposing defences nightmares. 1. Ouma “Marcelo” is capable of crossing fairly accurately with either foot as displayed in these highlights. 4. With two good crossers on each flank (Ouma and Nizigiyimana), Tuyisenge is bound to benefit immensely. 5. Tuyisenge is quick to thank his suppliers. Note that each time he scored, he raced across the field to thank Marcelo. This is something Olunga never did last year even though he benefited from really good suppliers. He better learn to do this in Sweden and at Harambee stars where the likes of Timbe might refuse to pass him the ball. 6. Tuyisenge’s ability to pit himself in the right spot at the right time is reminiscent of Hezborn Omollo, one of the club’s all time leading scorers and could see him net a dozen more goals. It is very rare that a defender much less a left full back can be seen as playing a pivotal role in the attacking fortunes of a team. But such is the case with fast rising youngstar Eric Ouma “Marcelo”. Not much was thought of him when he joined Kogalo straight from Kakamega high school. But ever since he was given a chance to showcase his abilities, he has proven his mettle. 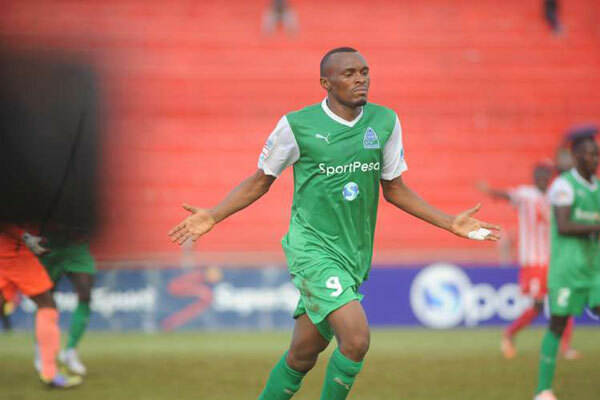 On Sunday yet again he played a pivotal role in Gor Mahia’s win over Thika United with pin-point deliveries to Jacque Tuyisenge that resulted in both goals. Brazilian Tactician Ze Maria who also refers to his charge as “Marcelo” is full of praise for the youngster. “He gives us quality and more dimension. He’s a quality player and at his age, he has a lot to offer and we are pleased to have him.” he said to the Nation. Ouma appears strong balanced and comfortable both in attack and defence, something he credits to the fact that he has played in all positions. “I’m a utility player and can play in any position. I used to be a striker before and I’m enjoying myself.” he said. And Ouma knows that it is hard work that will enable he and the rest of the team to excel. “The aim is to play and work hard and keep moving,” he told Daily Nation Sport on Monday. “We did well (against Thika) and my focus is to help Gor win the league, God willing.” he concluded to the Nation. Here is the complete list of the SportPesa Premier League transfers that were conducted in the month of June (previous club of player in brackets). Promising left back Eric Ouma “Marcelo” has signed another contract extension. But to the dismay of fans, the extension is for only another 6 months. Ouma has been the subject of speculation with reports linking him to arch rivals AFC Leopards. Other reports suggested he was due to leave for the USA on a football scholarship. He was supposedly offered a full scholarship by Lindsey Wilson, the same school that former Gor Mahia and Tusker ace Tom Odhiambo attended alongside Eric Ochieng “Cantona” in the late 1990s. Ouma joined Gor Mahia from Kakamega high school this season. He has quickly propelled himself to stardom even earning a place in the Harambee stars starting line-up. Chairman Rachier expressed his dissapointment at not signing a longer term contract. ‘Marcelo’ has proven himself in his position. He is a good player and we really appreciate his work so far. We wish he could sign for a longer term,” said Rachier to the club site. 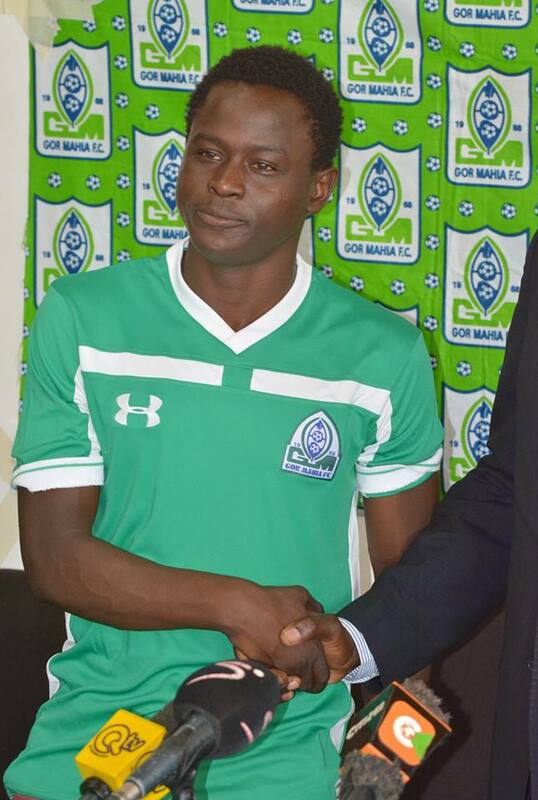 Gor Mahia have signed veteran defensive midfielder Crispin Odula. The lanky Odula has for the past one year been playing in Finland for AC Oulu. Odula is vastly experienced. He first played in the Kenya Premier League 10 years ago (In 2006). At the time he played for Coast Stars. He was an instant hit and already had offers from foreign teams. After a few trials in Europe, he ended up at Al Wahda in Saudi Arabia before returning to Kenya to play for Bandari, Azam, Coastal Union (Tanzania) and later Tusker. Last year he joined AC Oulu of Finland. Odula is seen as replacement for Khalid Aucho. He had initially been linked with a move to AFC Leopards. Rachier was happy to sign Odula who will add steel to the midfield as well as experience. “Crispin Odula is a seasoned midfielder. He should be an asset in our attacking and central midfield. We welcome him to the K’Ogalo family.” said Rachier. His listed date of birth is September 8 1989. 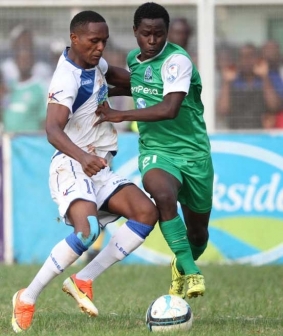 Ugandan midfield ace Khalid Aucho who has been the engine in Gor Mahia’s midfield since he joined in 2015, has finally departed, thus bringing an end to the speculation around him. Chairman Rachier confirmed as much. Aucho is set to attend trials at Aberdeen FC in Scotland’s top tier. This is the team where Sir Alex Ferguson first made a name for himself as a coach. In 2016, they finished second in the league standings behind Celtic.